Mykonos is not only for adults. Families with kids can have a great time here too, as the island has so much to offer to the youngest members of our families. For your accommodation, it would be better if you choose a hotel suite or a whole apartment. If your budget allows, take a look at Villas Mykonos. They offer more space, indoors and outdoors, and a lot of amenities. A Mykonos Villa would be great for your kids to play in your private garden or your private swimming pool. If you are planning to spend some time walking around on the island without your kids, look for a hotel that offers baby sitter services. Mykonos Town has a lot of beautiful Cycladic houses and alleys to explore with your kids. Make sure you all put on some comfortable walking shoes and …start walking! The picturesque neighborhoods will impress your children and will be a part of their nicest memories for their lives. The Windmills, Little Venice and Old Town are some of the places that your children will love. If you meet Petros the pelican, don’t be afraid of him. He is used to walk among crowds and he is friendly with kids. They are both located at Mykonos Town and they can give your children an idea of how life was in old times. History may be boring to them but seeing amazing sculptures and artifacts of the past will be both educational and pleasant. At the area named Tria Pigadia, in a 19th century traditional building, you will find the Aegean Maritime Museum. Here you will see models and replicas of ships from Minoan times to 20th century, coins from 5th century B.C., naval tools and instruments, artifacts and maps. Within the museum there is also a great library with 5.000 rare books. READ Why Is Traveling Good For Your Health? The Archeological Museum of Mykonos is located near the Old Port, just outside the center of the city. Its exhibits include a big number of pottery, sculptures, artifacts and jewelry, dated from 25th to 1st century B.C. The Cycladic style museum was built in 1902 to host some of the amazing findings of Rhenia and Delos. For most kids, the best part of holidays on a sunny island is watersports. 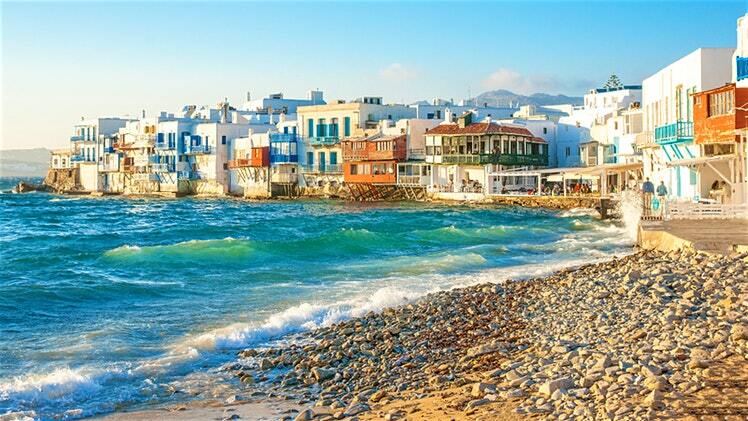 And there are plenty of beaches in Mykonos that offer safe water sports activities for kids, younger or older. At beaches like Kalo Livadi, Paradise, Elia, Kalafatis and Platis Yialos you will find banana boats and tube rides, parasailing, wake-surfing and skiing, wakeboarding and jet skiing. Just pick up the right activity for your kids, according to their age and abilities and let them have fun until they are really exhausted! At Agios Sostis beach you can try sea kayaks or even arrange a private kayak tour with the whole family. Diving and snorkeling are also very interesting activities for children – and for their parents too. You can find certified diving and snorkeling centers at Kalafatis, Paradise and Lia beaches. These centers offer organized diving tours, lessons and even certificates for new divers. All Mykonos beaches are very clean and they have an amazing, underwater life. You can see small fish swimming among guests in the sea. But if you want to see more sea creatures you will need to go near rocks or deeper in the sea. Just take all precautions and follow the directions of your qualified, experienced guide and you will have a wonderful experience to remember. Delos and Rhenia islets are located at a small distance from Mykonos, on its west side. They are accessible by ferries, touring boats or private yachts. Delos has been inhabited since the 25th century B.C. and has become the most important Greek island during the ancient times. According to the Greek mythology, it was the birth place of god Apollo and goddess Artemis. Today it is one of the best reserved Greek archeological sites. Remember that staying overnight on these two islets is forbidden, so make arrangements for your return trip early. Apart from sightseeing, Delos and Rhenia offer some great, sandy, quiet beaches to swim. Mykonos Luxury Villas are ideal for family gatherings since they get everyone together and have the chance to be accommodated in beautiful properties with plenty amenities for kids. There is no better way to enjoy the company of loved ones than relaxing together in the beautiful sunshine with a BBQ on the go or a private pool sharing each other’s happiness. If you want to rent villa in Mykonos , especially during school holidays, then is better to book early, as large villas are not as common as regular sized villas and they often get booked at least a year in advance.